Our self-contained annex called the East Wing is perfect for longer stays. Stay in our self-contained self-catering holiday cottage in the East Wing of the Hall, available through Norfolk County Cottages. The East Wing is self-contained with large and sunny rooms, decorated and furnished in traditional style. The three spacious bedrooms can easily accommodate six people. However, by closing off two of the bedrooms, the East Wing is available at a reduced price for two people. 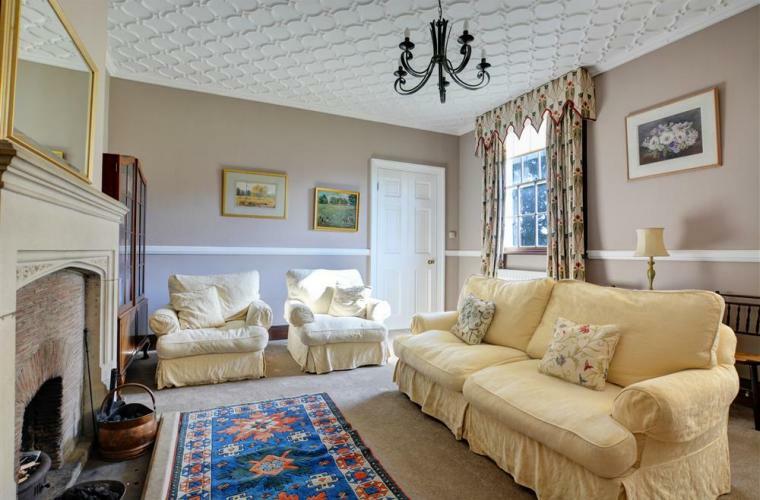 Sitting Room featuring patterned plasterwork ceiling, classic furniture, open fire, television with Freeview and well-stocked bookcase. Kitchen with electric cooker, fridge, freezer, microwave, washing machine, dishwasher, breakfast table and chairs. Dining Room with dining table and chairs. Shower Room with shower cubicle, washbasin and WC. Bedroom 1 with a king size bed. Bathroom with bath, washbasin and shower fitting. This is the accommodation that would be provided for two people. Bedroom 2 with twin beds, with En-Suite Washroom - washbasin but not bath/shower. Bedroom 3 with a king size bed. All bedrooms come supplied with towels. A travel cot can be supplied on request. Formal lawns at the front of the building and wider access to the 15 acre gardens, woods and lake. Sitting area outside the front with garden furniture.